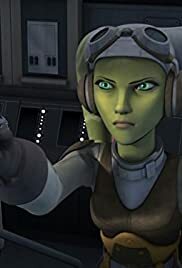 Hera Syndulla: I am *not* wasting my life! FRom about 5 min and 40 seconds till about 6 minutes into the episode, the voice actress for the female lead character, Sabine, changes the sound of her voice, whether intentionally or not, gaining a somewhat French accent. Interestingly enough this could be due to the fact that the voice actress in question, TIya Sicar, speaks a few languages, one of which is French.